Nautical by Nature: Big change and GIVEAWAY! If you type in aka-kate.blogspot.com you will still find me but please update your google reader, etc. to reflect the new location. A custom made ID/luggage tag in Lilly Pulitzer fabric! I think the link is bad though. Can I participate in your giveaway?? Congratulations on the new address. I would love to be entered. I'm a follower and have added this to my list of giveaways on my blog. Adorable! Can't wait to visit your new "address"! Awesome giveaway :) I am really enjoying following your blog! hooray for new beginnings! I'm a huge fan and follower of you Kate! 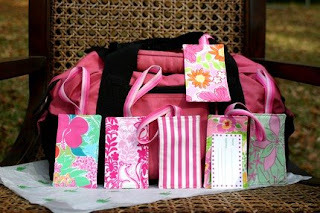 I love those tags, I think they are so cute and preppy and I would LOVE to win one! Congrats on the new address! I'm a devoted follower already, and will mention this on my blog, too! Congrats!! I am a follower and will blog about the giveaway! Yay for you!!! I was thinking about changing over, but I am so lazy!! Oh, I am a follower too!! Enter me please :) and I am already a follower!! I would like to enter the give away. I am a follower as well, but I am not sure how to "transfer" my following to the new site?? And I am a follower of course! I am a follower and I will give you some side bar space! congrats on your domain name! of course im already a follower, and i posted about your giveaway! Looks like a great giveaway! Thanks for doing this! I am a follower and love your blog! Yayyy! So exciting. So great. Thos luggage tags are super adorable. I'm such a fan. How fun to have those babies attached to your luggage as you stroll through the airport. how fun!! congrats on the new home! Hi Kate! I would love to win the luggage tags! So, I blogged about it AND am following your new link. Congrats on the new address! Congrats and I love those tags..Count me in!! I am also a follower!! I am a follower...and I'll be posting about it ASAP! I think your new site is beautiful and it has a great name! I'll make sure to update by reader right now! Great new blog address and love the bags! YAY for your new web address!!! Congrats on the new web address! These luggage tags are so cute! You have a cute blog which I enjoy reading. enter me! i am a follower too! Yay new site! I am a follower and google reader follower! So cool to have your own domain name! Congrats! I'm a follower, too. Congrats on your .com! How exciting! Thank you Kate. I would love to enter and I am a follower. congratulations on the new address :) i'll enetr! Love these tags -- would look great with my luggage when I take my trip to Savannah next month!! And, yes, I am a follower and will go post it on my blog!! don't bother to enter me, as i'm not a big lilly gal, but i just wanted to say congrats on the new address! that's so exciting!!! oh that is fabulous! i am of course a follower! Congrats on your new blog address! Oh! I love this :) Please consider me! I'm a follower too! Congrats on the new site! I just became a follower. Such a cute giveaway! congrats kate! Obvi I am a follower and just posted about this on my blog. oh how adorable! congrats on your new blog address. i would love to be entered in your giveaway. im already a follower and i added a link to my sidebar! Congrats on your new blog home! I love this giveaway. I'm a loyal follower and I posted this on the sidebar of my blog. Congrats on your .com! I'll change my google reader right now. I'd love to enter your giveway and I'm already a follower. HUGE congrats Kate!! Yay for having your own domain! oooh ooh! Enter me please! So adorable, Kate! I share your love for all things nautical, so obviously, I'm following! :) Yay for your new domain! Congrats on the address! Count me in the giveaway! I'm a follower and I've added your giveaway to my blog sidebar! I would love to win one of these luggage tags. Love the look of your blog - my favorite colors of pink and green. Sign me up please! I am a follower too! Thanks for hosting such a cute giveaway and congrats on the address! These are so cute! I am already a follower! (I think I might have commented already, but I can't remember) If I didn't, I'd love to enter! I'm a follower and I'm going to put this giveaway on my sidebar! I just got new luggage and this would work perfectly!!! Hello, I became a follower and posted about this giveaway on my blog. Thank you! What a great giveaway! I am a follower and I will be adding on my blog! I'm so excited!!! What an adorable giveaway! I also did #2,3,etc! Glad to be back blogging. Thanks for visiting my blog. ooooohh, pretty. I have a few trips this summer and this would be nice to add. Oh, and, of course, I'm a follower!!! Hey! I can't believe I've been so busy I almost forgot to enter! I am definitely a follower and will link back to your giveaway. Kate I am really hoping I win the awesome lilly luggage tags! Two entries for me, of course I'm a follower of your blog! Ooohh I just made it in under the wire... count me in - they look great! Lovely Lilly tags? I'm in! Congrats on the "move." I am commenting and I have long been a follower, so put me down for 2. Kate, fabulous! I'm already a follower, so 1 and 2 for me! Ooooh please include me! I'm a follower, too! I would loved to be entered and I just became a follower as well so 1 and 2! Congrats on the new address! !